I walked by the Capitol this afternoon on my way to the nearest walkable Safeway. (SW Waterfront Safeway.) Clear, but gray and cloudy, temperature hovering just around freezing, with a light breeze bringing windchill down below. 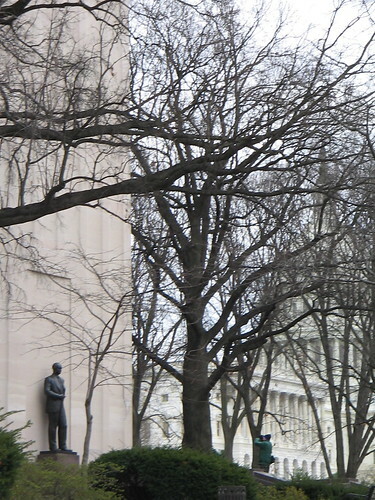 A photographer pauses to snap the Robert A. Taft Memorial near the Capitol. More on Robert Taft and his memorial at DCist. 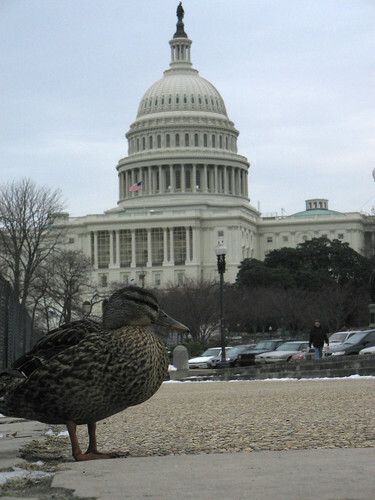 A cold duck warms herself up within her coat of insulating feathers by the frozen-over and fenced-in Capitol Reflecting Pool. The Capitol grounds are still a mess of fences and barriers and inaugural debris, even a week later. it’s been my experience that AOC and NPS tend to drag their feet on cleanup after major events. The fences from last 4th of July were all over the Mall as late as August in some places, so don’t expect to be able to walk on the Capitol Lawn or Lower Terrace for a couple more weeks at the very least.